Raytheon has awarded a potential $250.1 million subcontract to General Dynamics Advanced Information Systems (NYSE: GD) for manufacturing and engineering support of the U.S. Navy‘s Air and Missile Defense Radar. The companies will develop and test the AMDR-S Digital Receivers/Exciters and Digital Beam Forming components, then integrate them into the engineering development model radar, General Dynamics said Tuesday. Carlo Zaffanella, a vice president and general manager at General Dynamics Advanced Information Systems, said the business unit will bring open architecture and radar technology to its partnership with Raytheon. The AMDR will be designed to protect Flight III Arleigh Burke-class destroyers from ballistic missiles and detect air and surface targets starting in 2016, the radar’s planned operation date. 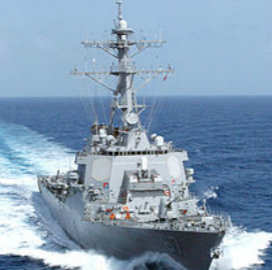 The radar system comprises of an S-band and X-band radar for long-range and horizon-search detection features, as well as a Radar Suite Controller for interface to the Navy’s Aegis combat system. The subcontract has a 10-year period of performance for work in the continental U.S. and Hawaii. Raytheon won the AMDR contract in October 2013.